100% Candice: I will never sell you snake oil! I will never sell you snake oil! So, yesterday's question of the day was "Okay, so now there's Pinterest, and Tumblr, and Google+, why should I be on all of these?" And my answer was simple "You shouldn't be". I am on all of them, and so many more (check out the incomplete list here) but I don't suggest anybody try to be everywhere. First you need to decide what message you are trying to send, what results you want and who your market is. Then you talk to someone like me to discover which networks are where your clients are and how you should be talking to them there. Second, even if you decide you need to be in 3 or 4 or even 5 places you should only do a couple of them at a time. Start with one or two and master it, then move on to the rest. It takes roughly 21 days to form a habit, so commit fully to one network at a time for 3 weeks until it stops being work, and becomes second nature, then move on to the next network. If there is any other marketing that gets results in less than 3 weeks please share it with me. I'll buy immediately. After having this conversation with TMISW, in which he gave me exactly 60 seconds to respond, I listened to an old episode of Marketing Over Coffee which basically says the same thing. This is definitely my favourite marketing podcast I've found. I've been going back a few months and listening to some older episodes. Loved hearing them talk about the exact 1 minute speech I gave last night. Don't create another internet marketing graveyard! You don't need to be everywhere, but you do need to be where your customers are and you need to be present. 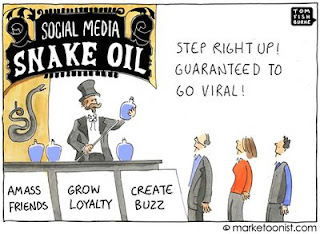 right on to the Snake Oil salesmen of internet marketing. You know, the ones who charge you a ridiculous amount to set up your pages and post a certain number of posts a week. I never recommend hiring someone to do the job for you, unless it's a community manager who actually works in your company. There is nothing wrong with wanting a little extra help while you get going until it becomes a habit, but you are the best representative of your company. You have the knowledge, the passion, the personality. Nobody can duplicate that on your behalf. 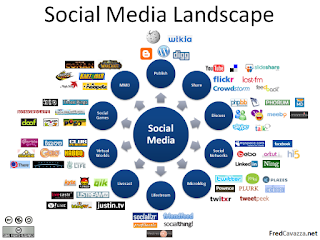 Please don't think using social media is some specialized skill that only some can master. You can do it, I promise.